From Code Central, you can monitor any number of build servers and/or desktops remotely and view all their coverage data. Code Central can collect coverage data locally if installed on the build server, or remotely using Collector. A Collector installed on the build server and connected to Code Central will gather coverage data every time your tests run and automatically send the results to Code Central. So, the build platform isn't as important as the process that's running your unit tests. 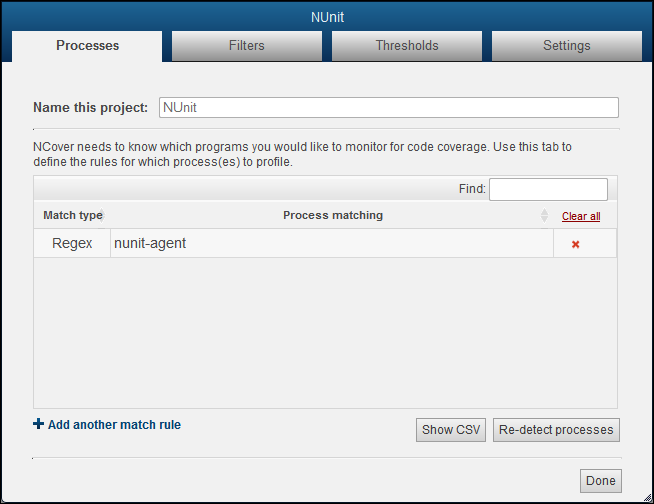 The first step is to create an NCover project where coverage results will be sent and displayed in the NCover GUI. From the Home view of the Code Central, click Add New to open the "Create a New Project" window and give your new project a name. 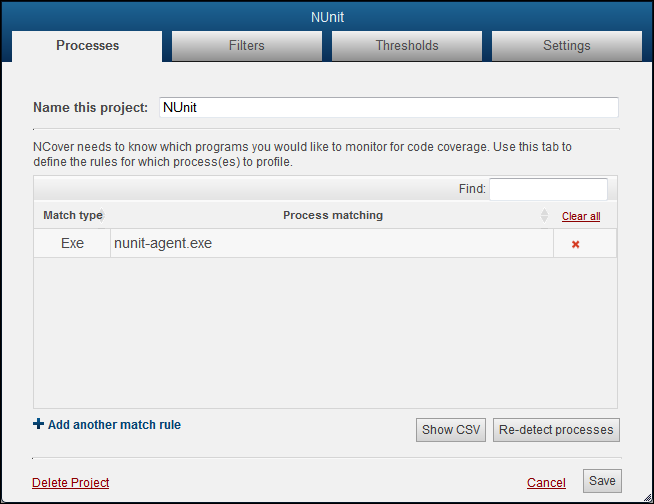 Next, tell NCover what processes you want to profile, using either Auto-Configure or Edit Match Rules. If you're setting up coverage for a process running locally on the machine where Code Central is installed, you can let Auto-Configure (see next heading below) create project settings for you. 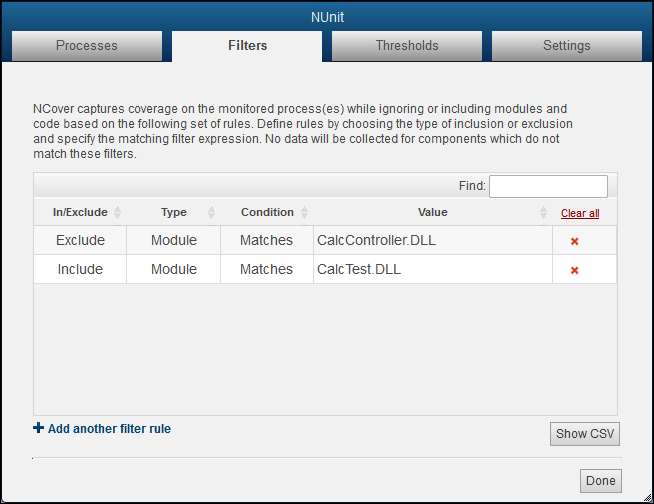 From the "Processes" tab, click on Edit Match Rules to specify the test runner you want to monitor. The Match type options are Regex and Exe. Let's say you want to monitor NUnit tests. Regex is a good choice in this case. The Regex option would be simply "nunit-agent", since the regex isn't case-sensitive. This regex pattern would match "nunit-agent.exe","nunit-agent-x86.exe," etc. You can also use a complete file path if you want to profile a process only when it runs from a specific location. 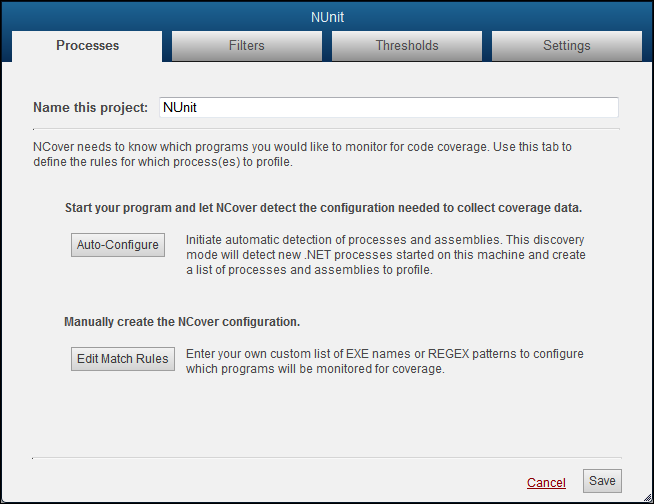 The second option for defining process(es) to cover is to click on the Auto-Configure button and let NCover create match rules for you. When your project selections are completed, re-start your test runner and run your unit tests to collect coverage. When your NUnit tests are complete, close your test runner to stop profiling and allow NCover to collect coverage data. When the data is aggregated, the results will be automatically displayed below your project on the Home view. Since it's likely that you have more than one project on your build server that uses NUnit (or MSTest, or Gallio, etc. 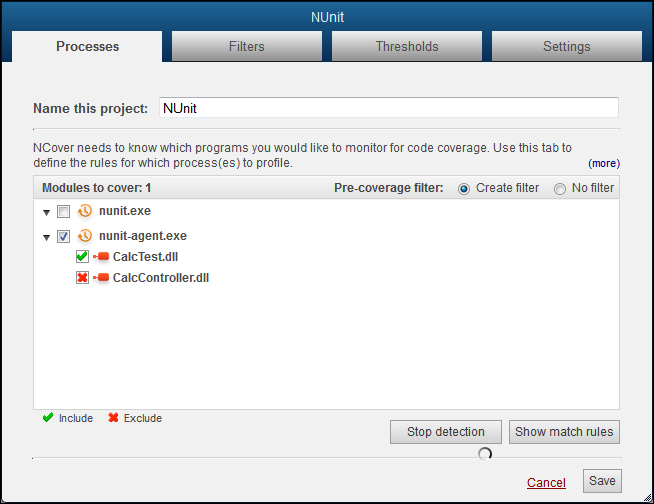 ), having a Code Central project set up to simply monitor the nunit-agent would gather coverage data each time NUnit runs. Send the coverage results to the project you specify (the one you created above). Summarize the coverage results and generate links to the Coverage Summary report. The first part of the NCover Run command is the NCover project and (optional) build ID and working directory, the second half is the arguments for the covered application. NCover Run can cover any .NET test runner, but the most common scenarios are profiling MSTest and NUnit. 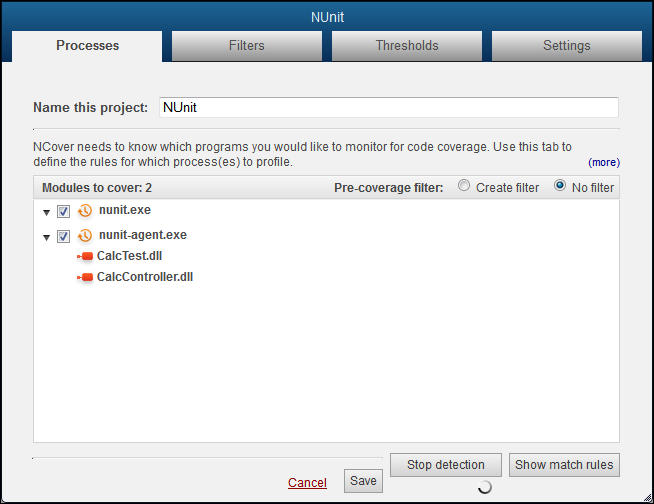 When NCover Run executes successfully, coverage will be collected on NUnit and displayed in your project in the Desktop GUI. The collection summary and report links will also be displayed in the command line output. When generating this report from Desktop please note that, unlike Code Central, Desktop does not serve external pages. This means that reports generated from Desktop can only be viewed locally, on the Desktop machine. Once NCover Run is working as expected, add it to your build script (usually as an ) and test again. The next time the covered process you've defined in the Code Central project is run on a QA machine or a build server, Collector will automatically gather coverage and send it to Code Central, where you can view and analyze the coverage results.